Welcome to our review of the Vortex 20–60×85 Razor HD Spotting Scope. Vortex makes some amazing optics, and the promise of the Razor to be an out-of-this world spotting scope is huge. Will the Vortex 20–60×85 Razor HD live up to its promise? Let’s find out. The Vortex 20–60×85 Razor HD does not come with a ton of accessories, which is slightly disappointing. All that came in the box is the spotting scope, eyepiece and objective covers, and a view-through case for the spotting scope. While the spotting scope does include a tripod mount, you don’t get a tripod along with the scope. I suppose, considering the excellent optics and the usual pattern of included tripods ending up on a back shelf in my garage because they’re such poor quality, that I won’t ding this particular spotting scope too much for failing to include something I probably would have squirreled away or recycled anyways. 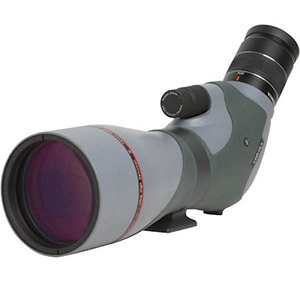 The Vortex 20–60×85 Razor HD has a large 85mm objective lens, and provides magnification between 20X and 60X. Zoom is accomplished via the eyepiece, and there is a dual focus knob for ultra precise focusing. At the end of the day, the clarity and crispness of the image is what’s important, and this spotting scope meets and exceeds all of my rigorous expectations. Even better, the spotting scope has edge-to-edge clarity, allowing you to watch moving objects without having to adjust your alignment until they move out of the field of view. How Easy is the Vortex 20–60×85 Razor HD to Use? The Vortex 20–60×85 Razor HD is very simple to use. The magnification knob on the eyepiece is easy to adjust, and the dual focus knob on the unit provides fingertip-adjustable coarse and fine focus. The Vortex 20–60×85 Razor HD is great to use on a tripod, but the unit also includes a balance ridge for use on a flat object like a table. The Vortex 20–60×85 Razor HD has premium High Density optics made from extra-low dispersion glass, so you get the ultimate in resolution and color fidelity. The optics are fully multi-coated, so you get the most possible light transmission and multiple anti-reflective coatings on all air-to-glass surfaces for maximum brightness. The prisms have multi-layer coatings to keep your image bright, clear, and color-accurate. The light transmission is so good on this spotting scope that I’ve used it to check out the surface of the moon and even Jupiter. It’s no telescope, mind you, but it is much quicker to set up than my telescope. This spotting scope utilizes a porro prism design, which gives amazing image quality and performance in a traditional design. The porro prism makes this spotting scope fairly large and heavy, but still weighs in at less than four and a half pounds. The field of view of the Vortex 20–60×85 Razor HD is 117 feet at 1,000 yards with 20X magnification, and 60 feet at 1,000 yards zoomed out to 60X. This is more than enough field of view for excellent spotting, and I’ve been able to watch wildlife and terrain quite easily with this spotting scope. Focus is fantastic, with the dual knobs turning just easy enough to adjust with your fingertips. There is also just enough resistance to prevent accidental adjustments, so the Vortex 20–60×85 Razor HD provides the perfect balance of keeping things in focus while still allowing you to quickly and easily refocus when you want to change the object you’re looking at. The Vortex 20–60×85 Razor HD is an angled-body design, but the same model is also available in a straight-body design. It is coated with ArmorTek, which is ultra-hard and scratch resistant to prevent the lenses from scratches, oil and dirt. The tripod ring is rotatable, allowing you to change the device to a sideways position and allowing for multiple viewing angles. The eyepiece is removable for use with a digital camera adapter, but the adapter is not included with the spotting scope. I love the camera adapter, though, and use it regularly to capture images of the birds and wildlife around my property. How Durable is the Vortex 20–60×85 Razor HD? This spotting scope is one of the most durable I’ve ever seen. The first time I attached my camera to the scope, I discovered that my camera was a bit too heavy and threw the whole kit off-balance. Over it went, crashing to the driveway, and I was mortified at what I’d just done. When I picked everything up and inspected it though, the spotting scope was still unscathed. My camera was a bit scratched up, but everything still works perfectly even after that mishap. The lenses are O-ring sealed to keep water out, and the optics chamber is argon-charged to prevent fogging. All in all, this is an excellent spotting scope and is darned near bulletproof. Thanks for reading my review of the Vortex 20–60x85 Razor HD. This is an outstanding spotting scope that works perfectly in almost any situation. It is a bit heavier than most, but it is still light enough to take along on a backpacking trip. It is well worth the added weight for such a high-performing spotting scope. Thanks for the review. You mentioned the weight – it’s a little heavy. How is the balance? That is, if the location of the tripod mount is the fulcrum, does it balance well there from front to back? You say the eye piece can be removed for use with a camera, how hard would be to find a matching adapter for it?